Employee Branding: Who Are You, and Who Do You Aspire to Be? These employees are not happy because their jobs are not the right fits for them. These roles don’t match who the employees are or who they want to be. Stuck in jobs they don’t enjoy – with no plans to get out of them – the employees’ work suffers. They are passed over for promotions because their performance is subpar. In short, they trap themselves in an unhappy role, because they have no clarity about who they are and who they want to become. Sure, these employees might have vague notions of who they are; they might even have some ill-defined dreams about where they’re going to end up. What they need, though, is definitive structure: they need to know exactly who they are, exactly where they want to go, and, most importantly, what they need to do to become the person they aspire to be. How do employees get this clarity? According to Orrell, they get it by consciously building and actively maintaining their personal brands. “When you’re mindful of your personal brand, it starts giving you more structure and a strategy and a path to conduct yourself accordingly and kind of hit the goals that you have in the back of your mind,” she says. Without a solidly constructed and defined personal brand, an employee has no strategy for getting from A to B – from “me now” to “who I want to become.” Their career goals, their career path – even their current career status – are all intangible and out of reach. I’m tempted to call Orrell, who started her own marketing and advertising agency in San Francisco at the age of 25, precocious, but that would just be condescending. It’s far more accurate to say that she’s preternaturally enthusiastic about what she does, and this enthusiasm has translated into an encyclopedic knowledge of branding in all its forms. But before Orrell was writing guidebooks for employees, she had to make the jump from corporate branding to leadership and talent. “I got kind of burnt out, working for a lot of the big high-tech companies and such,” Orrell says of her days as a marketing/advertising consultant. The oversized offices, the vast ranks of employees – after 20+ years of running her own agency, it all got to be a little tiring for Orrell, but conversations with her clients would end up leading her on a new career path. Orrell was researching Millennials as a consumer group so that she could help her clients reach them as customers. She found that her clients, trying to figure out the Millennial-as-consumer, were equally as baffled by the Millennial-as-employee. “I’d be in meetings with directors and V.P.s of marketing and they’d say things like, ‘Well, it’s great about them as consumers, but I’ve got a couple of them on my team, and they’re driving me nuts. I don’t know how to manage them or train them,’” Orrell says. From there, Orrell watched the confusion and frustration grow. “Then it started turning into, ‘We don’t know how to recruit them well and retain them,’” she says. Orrell was conducting leadership workshops and seminars at various well-known companies when she noticed that one topic in particular resonated with everybody, regardless of their age: “I get a lot of 30-, 40-, and 50-year-olds that come up to me after [a workshop] and say, ‘Wow, I really wish people had been talking about personal branding in the career sense and the leadership sense back when I was younger, because it would have really helped my career path, and it really would have helped me make better decisions,’” she says. Orrell decided to take matters into her own hands. “So I decided, alright, I’ve been doing the workshop for over three years. I’ve got over 20 years of experience in marketing and branding,” she says. 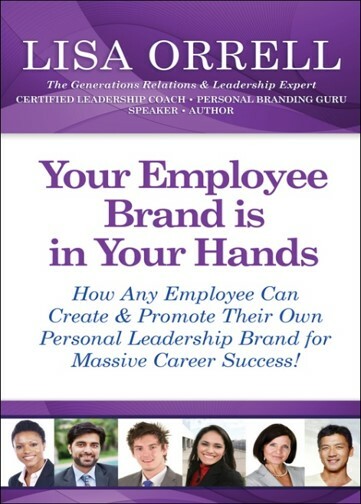 And thus was born Your Employee Brand is In Your Hands, Orrell’s fourth and most recent book. Orrell says that many peple don’t realize that their employee brand is at play in every interaction they have – and, as a result, employees can end up doing themselves a lot more harm than good. Before you do or say anything, Orrell suggests you ask yourself, “Is this going to build up or break down my personal brand?” Because personal brands are not just about who we are now, but also about who we want to be in the future, so we always need to be working on strengthening our brands. It’s not enough to know who you are as an employee. It isn’t even enough to know who you want to be. You need to build the bridge between the two. You need, Orrell says, to take solid steps in the right direction. Clarity: A well-crafted employee brand gives an employee insight into their strengths and their weaknesses, into who they are and who they aspire to be. Notoriety: When your personal brand is strong, people will have more consistent experiences with you. They’ll know what to expect, because you’re living your brand according to the same values every day. When people trust and respect your personal brand, you gain company and industry notoriety as someone who is an expert and who can be counted on. Building a strong employee brand is not easy. It’s a process of constant vigilance, one that requires employees to be in touch with their thoughts, values, feelings, and beliefs at all times. Though it may take effort and energy, such disciplined awareness could pay off well – just ask Orrell.